Evan Yorke Nepean was born in November 1909, the son of Major Sir Charles Molyneux Yorke Nepean and Mary Winifred. He was educated at Winchester School and Downing College, Cambridge where he read Natural Sciences. After graduating in 1931, he joined the Royal Corps of Signals and was commissioned in 1933. He was then sent to the North West Frontier Province of India where he remained for five years and alongside his military duties, learnt to speak Urdu. 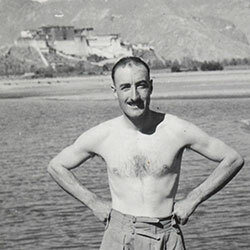 In July 1936 Nepean was summoned to join the Mission to Lhasa headed by Basil Gould. He and fellow Signals officer, Sidney Dagg, were the communications specialists for the Gould mission during their time in Tibet. A telegraph line was already in operation as far as Lhasa but "It was a single strand of galvanized iron wire supported on light wooden poles with no specific insulation... Mounted linesmen patrolled the route re-erecting any poles that were blown down and repairing breaks in the line." (Croston 2002:39) Nepean and Dagg's task was to set up and operate a portable wireless which could transmit messages should the Mission go beyond Lhasa. In fact the Mission remained in Lhasa but the setting up of the wireless had a great impact in the city. It enabled the British to counter the influence of the Chinese-run wireless and thereby curb the Chinese monopoly on supplying outside information to the Tibetan government. Nepean spent three months in Lhasa before being recalled by his commanding officer to the North West Frontier. During his time with the Mission, he and Dagg were occupied transmitting cipher messages to the Government of India. They expertly addressed themselves to the challenge of transmitting at high altitude and to official communications but they also exchanged messages with amateurs in different parts of the world. Nepean and Dagg also made an important contribution to a key objective of the Gould Mission: strengthening and improving relations with the Tibetan government and residents of Lhasa. This was achieved (in part) by providing entertainment in the form of film shows. It was Nepean and Dagg who set up and maintained the projection equipment at the British Mission house, the Dekyi Lingka. Nepean also assisted Spencer Chapman in his photographic activities and took many photographs of his own. In 1939 Nepean was recalled to Britain to work for MI8 (military intelligence) on codes and ciphers. In 1940 he married Georgiana Cicely Willoughby with whom he had three daughters. In 1941 he was posted to Iraq and later he joined the 8th Army in Egypt. He inherited a baronetcy from his father in 1953. Following post war appointments in Singapore and Germany he left the army in 1957 and worked for the Civil Service. In 1959 he took a retired officer's staff appointment in the Chief Signal Officer's branch at HQ Southern Command until his retirement in 1973. He died in Salisbury, Wiltshire in March 2002. Croston, R. 2002, ‘The Story of AC4YN - A Radio Adventure in Tibet, 1936’, Radcom , June: pp 39-40. Croston, R. 1982 ‘The AC4YN Story - a Tibetan Adventure circa 1936-1937’, 73 Magazine pp.10-12 Obituary, 2002 The Times , Saturday 6 April.